The Designio gas fire has a smart finish with clean lines. 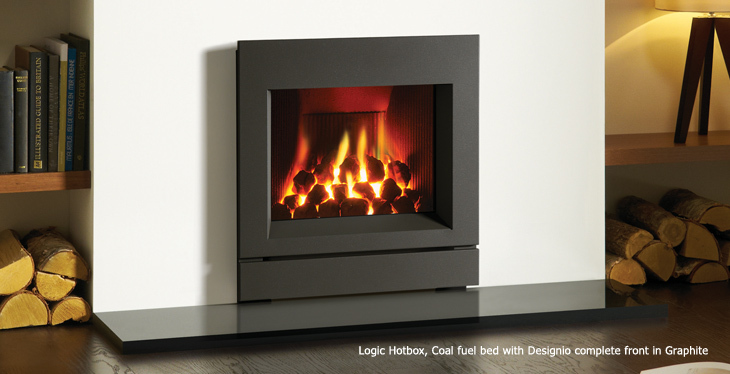 This fire exudes contemporary style and is available in versions to suit most homes – even those without a chimney. The fire has the following fire options: E-Box, E-Studio, VFC, Logic Hotbox, Logic Convector and Logic HE. The E-Studio fires have a white stone fuel bed, E-Box fires have a coal or pebble fuel bed option and the VFC fires come with a coal fuel bed. Fuel effects: White stones, Coals or Glass Bead fuel effects (dependant on the type of model). Also available with remote control. The complete Logic family or fires are available with your choice of two different control systems; Manual Conrol or for the ultimate luxury heating experience, a Remote Control to give you convenient control from the comfort of your sofa.